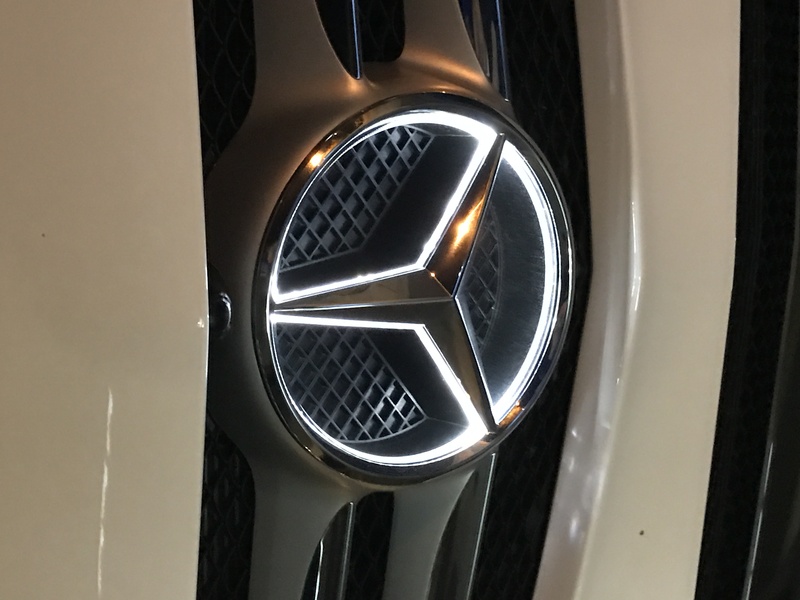 LED headlight is a safety feature, it lights up the road much better than halogen lights, whereas the illuminated star serve no other purpose than to emphasis the Mercedes logo. Sure, they could make round led headlights, but everybody wants to look different. I wouldn't call the shapes of any of these car led headlights a safety feature. Its not the shape of the LED headlight that makes it a safety feature, its the brightness. Mercedes will continue to offer the illuminated star as an option as long as there are pretentious owners who is willing to buy it. Any option that is added or taken from a car by the owner makes the car the way they want it. I am good with anything someone wants to do with their car. If they want pink rims or blacked out windows or wings on the car let them do whatever they want. It is there car to customize the way they want it. I enjoy customizing my MB the way I want it. If someone does not like it that is to bad. it is mine to do what I want with it. I really do not give a S--t what someone else thinks. I also believe it is discourteous to criticize what someone has done to there car. I always tell them it look great. The mods are done because they are proud of it. It should not be criticized because of some ego trip another member has to make them feel good by criticizing what was done. But then courtesy and politeness some people no nothing about. Let members do what they want because it looks great to them. In case you haven't read the OP's post, he asked us for our opinion. Right and some of you really gave it to him Well done. I think you are missing the point here... Giving an opinion is one thing. Your posts are criticizing and trying to ridicule people who made the changes to their car. Then on top of it then talking about "gold chains", making cars look like "Christmas trees", and "pretentious" owners... It is kind of inflammatory. BTW, to your other comment about led lights being a "safety feature", I certainly understand can be brighter, but my point was car makers could make round and bright led headlights, but they don't. They make distinctive styles/shapes to aid in brand recognition of the car. These shapes have nothing to do with the safety factor, but they just look cool in someone's opinion. Just like the illuminated star. ​​​​​​​In fact, my old e39 BMW had "angel eyes" and that wasn't even an option. At least with the illuminated star it is an option so you can have it either way and personalize your car. 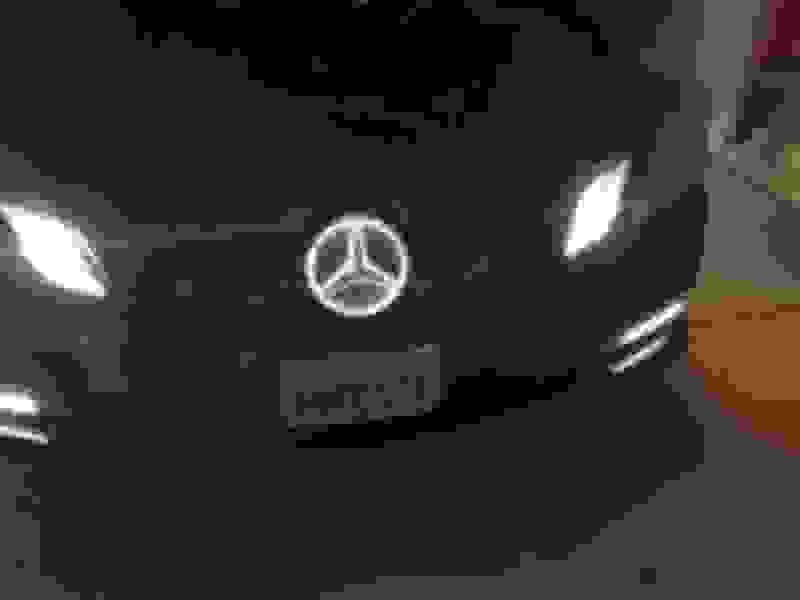 I saw an illuminated star for the first time a few nights ago on a 2014/2015 E350. It wasn't something I ever seriously considered, but it didn't look over the top like I thought it might. It was pretty subtle and looked kind of cool. It actually made me consider wanting to get one for a split second, but I didn't think it was for me. I think it's because I'm kind of an introverted person, and I get looks already driving my E550 and my other old sports car, so I don't feel comfortable doing it. I certainly wouldn't think bad about someone who had that as an option though. Someone might say getting the star and other certain options/mods are "pretentious," but I think what's even more pretentious is passing judgment on the people who choose to do that. No one really knows the reasons for why people do the things they do. 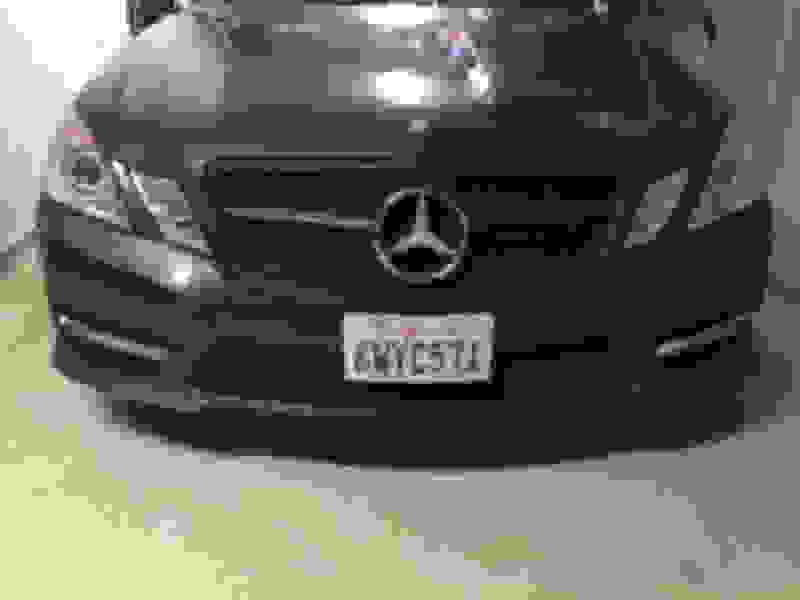 Maybe they just thought it looked cool, or maybe when they went to the dealership, the particular car they wanted already had it on as an option.. So much negativity; just hang loose! I never said anything about gold chains, and perhaps the word pretentious a bit harsh, but my point is they are trying to draw attention to themselves. BMW has round LED headlights and I think its very subtle and attractive. I think you are confusing headlights with daytime driving lights. Daytime running lights do come in all shape and sizes, but again, they are safety features. Mercedes for year had just a boring LED light car for DRL. I said gold chains and I would correlate the light up star with gold chains, teeth grilles and the term bling-bling. Maybe even the logo puddle light projector. All the same wavelength. And I said pretentious, because that's what the illuminated star says... "look at me!" But I hear it's not noticeable during the day, so even people who know to look for it might not notice/care. In the end, do what you will and only care about how you feel about it, because none of our opinions (positive or negative) matter. I had one behind me early yesterday morning. It was so subtle compared to the brightness of the headlights that it is hard to notice. I think pretty much any aesthetic alteration is "look at me!" to some extent. But I think some people who criticize the illumination have mods on their cars that go far beyond a little glowy star. I also have the illuminated star and don't understand all the biting comments. I for one am looking to make my car standout from others...the illuminated star (for those that have actually seen it) is barely noticeable. But as Katt Williams would say "you know you're on your game when ya got a bunch of haters!! I thought I only provided my opinion which was "Eh" which translate to I could take it or leave it. Everyone, with or without the light up star, please just enjoy your superb rides. I for one have never forgotten my 1979 Toyota with 90 hp, a 3 speed automatic, and a rust hole in the he trunk clear through to the road which I eventually closed up with a mesh and fiberglass patch kit. My crowning achievement on that car was pulling the Fujitsu radio and putting in a Blaupunkt Frankfurt radio, a clarion cassette deck and some no name 6x9s on the back deck. You know the old joke, you can call my dog ugly, you can call wife ugly but please don't call my car ugly I think this subject touches a lot of people's nerves. A car is like an extension of the owner's personality, you are basically calling them tacky. point is...opinion and criticizing are 2 different things. lets not confuse them. not siding with anybody here. i like the illuminated star, but i can also see why others dont. Last edited by beejAMG; 11-07-2016 at 04:16 PM. Guess you just had to get the last Tacky in. We will wait for your modification Sure hope it is not tacky since you said the car is extension of yourself. No one would want to insinuate you are tacky Right!!!! Have we become so politically correct as a society that we cannot even say the word tacky anymore. Maybe motor trend should give their car of the year award to every car manufacturer, that way, nobody will feel offended. 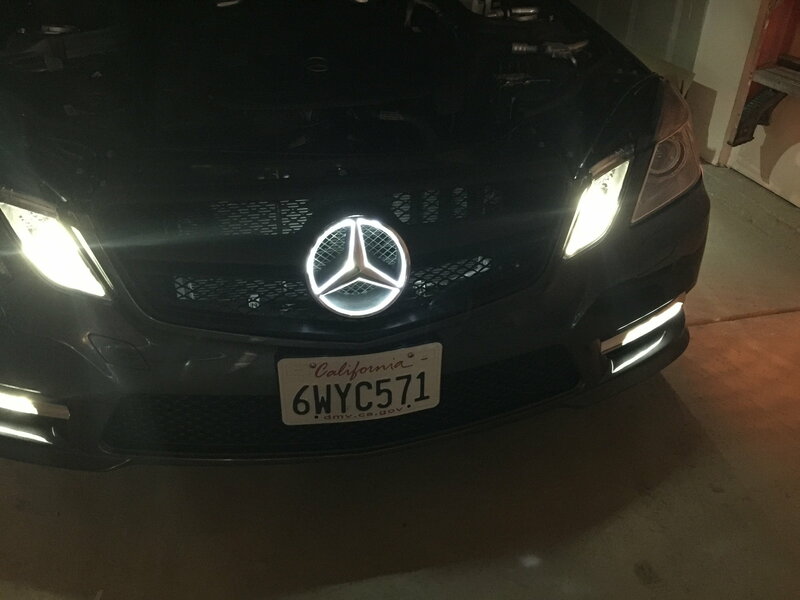 Saw the LED star at the dealer last year and thought it was cool. So I bought the grill with the LED star from a vendor a few weeks back and install it. An hour later I was pleased. Also bought another LED star for my wife's C204 which we picked up a month ago. Last edited by b6tbfmp; 11-26-2016 at 11:47 PM. It came standard on my new car. I like it.